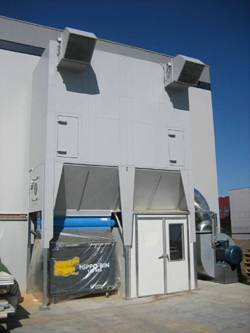 Australian Dust Control is continuing to expand its installation of Reverse Flow dust filtration systems with one of its most recent installations being for the high profile door manufacturer, Designer Doors Plus. They are based in Victoria and due to expansion have re-located from Thomastown to Campberfield. Designer Doors Plus specialise in the manufacture of flat panel doors which are predominantly made from MDF board. Their previous dust filtration system was inadequate to suit their future needs. Australian Dust Control worked with them to provide the best possible solution in achieving their goal which was to improve productivity as well as to have a more efficient waste handling system. The Reverse Flow filtration system will allow for future expansion with their recent purchase of new CNC Router machine as well as being energy efficient. The Reverse Flow dust filtration system installed at Designer Doors plus was fitted with a 75 kw fan and a 3 cubic metre storage skip bin with plastic liner to contain the very fine dust particles produced during manufacturing process. Australian Dust Control’s unique Variable Speed Drive was also fitted to the Reverse Flow dust filtration system which controls suction levels at each machine. This energy efficient feature also allows the capability to increase suction as more machines are added.